It will quickly introduce an Entered Apprentice into fraternal visiting. It should reinforce the responsibility that the Sponsors and the Worshipful Master have with every new candidate. 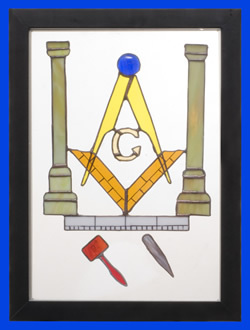 It will assist with the bonding of the Entered Apprentice with his lodge, his sponsors and the Worshipful Master. It will give the Entered Apprentice an introduction to the size of the District and Masonry in general. The Entered Apprentice Mason with the support of his sponsors, the Worshipful Master and other brethren of his lodge, will as soon as possible move the Travelling Entered Apprentice Display (TEAD) to the next lodge in Ontario District having an initiation. It should be presented by the Entered Apprentice with the assistance of his sponsors and the Worshipful Master to the new initiate following the initiation ritual. The Masonic Lodge to receive TEAD should be contacted in advance of the visit. At the beginning of the meeting when the delegation is introduced the visiting Worshipful Master should explain the purpose of their visit. Record in the log book the name of your lodge, the Entered Apprentice, his sponsors, the Worshipful Master, the date of the visitation and the name of the lodge to which you have taken the display. When your lodge receives TEAD, the Worshipful Master will find out which lodge in Ontario District will be doing a First Degree and then coordinate the visitation to deliver TEAD to that lodge. 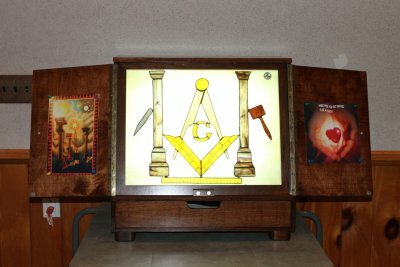 (Ideally the Worshipful Master and/or the lodge Secretary will find out where the next initiation will be in Ontario District ahead of time.) TEAD should move to the next lodge within 2 weeks of receiving it, if at all possible. Send an email to the Ontario District Visitation Chairman, Vice Chairman and District Secretary indicating the same information that you have placed in the log book. The Ontario District Visitation Chairman will monitor the movement of and will encourage the Worshipful Masters to ensure that it moves within a 2 week period. If the Display Case has not moved in a 2 week period the Visitation Chairman will be contacting the Worshipful Master to encourage a visitation with their Entered Apprentice(s). TEAD is to stay within Ontario District.